466 pages | 8 B/W Illus. The marginalization of women in economics has a history as long as the discipline itself. Throughout the history of economics, women contributed substantial novel ideas, methods of inquiry, and analytical insights, with much of this discounted, ignored, or shifted into alternative disciplines and writing outlets. 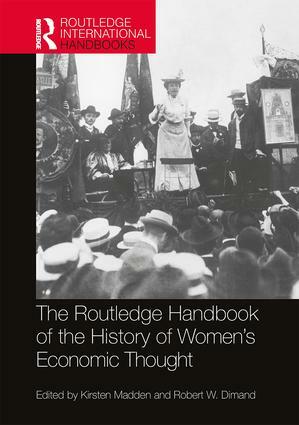 This handbook presents new and much-needed analytical research of women’s contributions in the history of economic thought, focusing primarily on the period from the 1770s into the beginning of the 21st century. Chapters address the institutional, sociological and historical factors that have influenced women economists’ thinking, and explore women’s contributions to economic analysis, method, policies and debates. Coverage is international, moving beyond Europe and the US into the Arab world, China, India, Japan, Latin America, Russia and the Soviet Union, and sub-Saharan Africa. This new global perspective adds depth as well as scope to our understanding of women’s contribution to the history of economic thought. The book offers crucial new insights into previously underexplored work by women in the history of economic thought, and will prove to be a seminal volume with relevance beyond that field, into women’s studies, sociology, and history. Kirsten Madden is Associate Professor of Economics at Millersville University, USA. Robert W. Dimand is a Professor of Economics at Brock University, Canada.